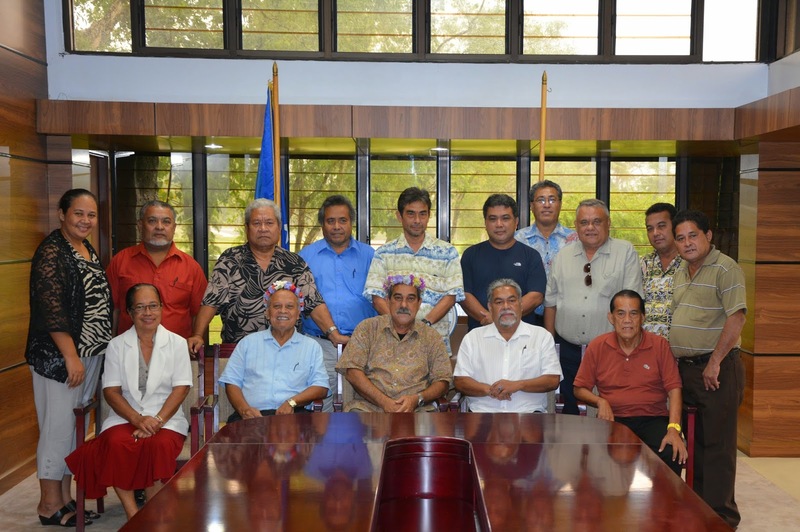 FSMIS (May 14, 2015): A delegation of thirteen respective Senators from the Pohnpei State Legislature paid a courtesy call on the Federated States of Micronesia President Peter M. Christian and Vice President Yosiwo P. George in the morning of May 14th at the President’s Conference Room. Welcoming the delegation, President Christian conveyed greetings to the State officials and spoke about the importance of commitment to solidifying mutual trust and harmony between State and National Governments. The members of the delegation conveyed to the President and Vice President their congratulatory remarks and highlighted some endeavors and recent concerns. Given his extensive tenure and former experience with the FSM Congress, President Christian emphasized the principal role Legislative bodies play in our system of government and expressed his appreciation for the delegation’s high interest in staging the meeting. The delegation led by Vice Speaker Francisco L. Ioanis included, Senator Nelson N. Pelep, Senator Magdalena A. Walter, Senator Salter Loyola, Senator Nixon B. Soram, Senator McGarry Miguel, Senator Marvin Yamaguchi, Senator Aurelio P. Joab, Senator Alpino Kerman, Senator Rensper M. Liwy, Senator Stevick Edwin, Senator Nihlis I. Ernest, and Senator Sendilina Lekka. The visiting group also included some staff members from the legislature. President Christian and Vice President George were accompanied by Chief of Staff Leo Falcam Jr.